White Paper: How To Identify When Your ERP System Is Mis-Firing. There are many, many examples of ERP failures. Most of the headlines tend to focus on implementation project failures – eye watering budget and timescale overruns. However, an ERP system could be implemented on time and to budget, but still be a failure. If it’s not delivering business benefit and value to your business on an ongoing basis – then it’s mis-firing. Or worse, failing. So many companies fail to make the most of the considerable investment they’ve made in their ERP. 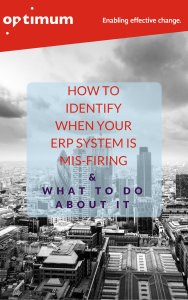 In this paper we highlight the warning signs that your ERP system is mis-firing and what to do about it.